Emmet must go on a quest to save his friends, who have been abducted and taken to the dreaded Systar system. With the average cost of a Lego brick at about 10 cents a piece, the only thing plaguing our minds while watching "The Lego Movie 2: The Second Part" was, "how much money did the family in this film spend on their vast collection?!" This sequel to the smash hit "The Lego Movie" is directed by Mike Mitchell, who had directed prestigious films like "Deuce Bigelow: Male Gigolo," "Surviving Christmas," and "Alvin and the Chipmunks: Chipwrecked." Though they don't direct this sequel, the screenplay is once again written by "The Lego Movie" scribes Christopher Miller and Phil Lord. In the five years since the events of the first film, the world has fallen into chaos, and the once-thriving city of Bricksburg has turned into a bleak, barren, post-apocalyptic place called Apocalypseburg that resembles "Mad Max: Fury Road." The citizens of this wasteland have been hardened by these changes, and they now live in fear of inevitable attacks from the Lego Duplo figures from the dreaded "Systar system." One such figure, General Sweet Mayhem (Stephanie Beatriz), comes and abducts Unikitty (Alison Brie), MetalBeard (Nick Offerman), Batman (Will Arnett), Lucy (Elizabeth Banks), and Benny the spaceman (Charlie Day) to attend the wedding of Queen Watevra Wa-Nabi (Tiffany Haddish). Now, Emmet must go on a mission to rescue his friends from the dreaded Systar system where nothing is as it seems. 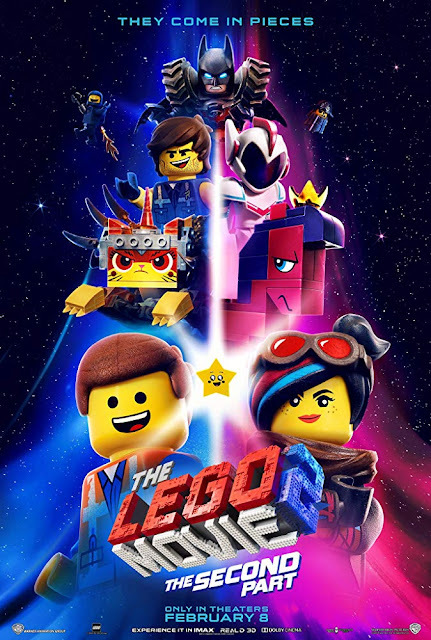 We absolutely loved "The Lego Movie," and this sequel offers up much of the same in terms of its story, jokes, and tone. It is loaded with self-aware humor, countless pop culture references, and an inspirational message to tie all of its Lego shenanigans together. That being said, something doesn't quite click as well with this second installment. Maybe it's because there have been two other movies in between Emmet and Lucy's story ("The Lego Batman Movie" and "The Lego Ninjago Movie"). Maybe it's because the pop/geek/nerd culture-laden inside jokes are wearing thin. Maybe it's because this premise has run its course and is now starting to feel like little more than a feature-length commercial for Lego and Lego Duplo. This is not a bad movie, but it's definitely a step down from the first film in this series. The story is rather basic, and where a clever play-on-words made for some surprising reveals in the first installment, the words and phrases unique to this sequel are more obvious this time. Phrases like 'Systar System' and 'Our-Mom-Ageddon' just don't have the same punch or seem as clever as 'the Kragle.' Though Lord and Miller try their best, the surprises in this script just aren't there. One could argue it isn't Lord and Miller's writing that's the problem, but rather Mitchell's direction that seems less flashy and on-point. Don't get us wrong, there are some laughs in the film. I laughed quite a bit through its runtime, though BigJ could only muster up some light chuckles. 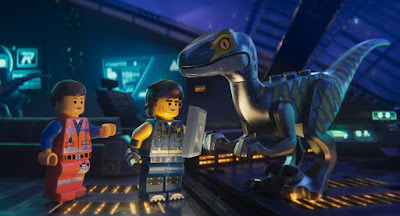 We both enjoyed the voiceover work from the returning cast, as well as newcomers to the series Tiffany Haddish, Stephanie Beatriz, and Chris Pratt-channeling-Kurt Russell. The film has a few catchy musical numbers that kids (and Lolo who's pretty much a kid) will enjoy, including "Gotham City Guys," "Everything's Not Awesome" (AKA the bummer remix), and "Catchy Song." There is also a decent message about finding unity through differences, which is the second family film in this short year to push that message (the other, better choice being "The Kid Who Would Be King"). We have a strange feeling this won't be the last movie in 2019 with this same message. In the end, though there is a lot to like about "The Lego Movie 2: The Second Part," it takes a big step down from the original "Lego Movie" and even falls short of "The Lego Batman Movie." We do feel that overall, fans of the LCU (Lego Cinematic Universe) will be satisfied with this offering, but there is a chance that, much like BigJ, you could leave feeling a little underwhelmed with this installment.